September 11, 2018 at 11:39 pm. CHICAGO — If the Chicago Cubs are going to stave off the Milwaukee Brewers down the stretch for their third straight National League Central Division title, finding ways to win tight ballgames will be key. And if that’s to happen, their pitching will have to certainly do its part, which loomed large as the Cubs were able to push their divisional lead back to two games heading into Wednesday’s series finale at Wrigley Field. Chicago’s bullpen backed up a stellar start by Jose Quintana in a 3-0 win over the Brewers on Tuesday that kept Milwaukee from moving into a virtual tie for first place. The victory also snapped Chicago’s three-game losing streak. 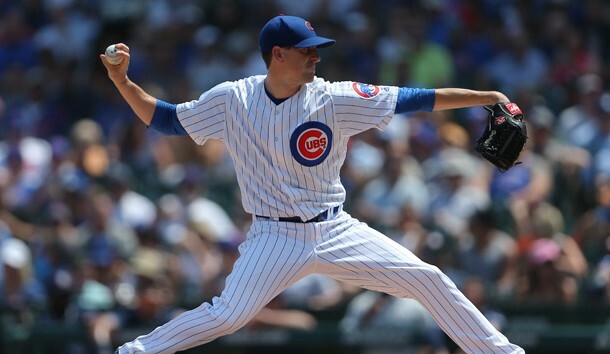 But as the Cubs look to again create more distance not only on Wednesday but as the regular season winds down, at least one of their relievers realizes he has to get back on track. Before Tuesday’s victory, Carl Edwards Jr., told reporters that he has to again become a critical part of Chicago’s bullpen. In his past seven appearances, Edwards has an ERA of 1.73 but has surrendered key runs, including on a wild pitch that spelled the difference in a one-run loss in Monday’s series opener. He likened his recent struggles to writer’s block. Chase Anderson takes the mound for the Brewers. Anderson (9-7, 3.95) hasn’t lost since July 14, but has five no-decisions in his past seven outings. He scattered five hits, allowed two runs and struck out five over five innings in his last start against the San Francisco Giants. Anderson is 4-4 with a 2.91 ERA in 10 career starts against the Cubs. Wednesday’s game will mark the final face-to-face meeting with the Cubs during the regular season. Although there’s still time to catch Chicago this month, the Brewers realize that games like Wednesday’s carry some extra weight – and meaning. At least publicly, however, manager Craig Counsell’s players won’t admit it. “We feel good,” Brewers third baseman Mike Moustakas said on Monday, according to the Milwaukee Journal-Sentinel. “Each day is a big game for us. Each time we step on the field, we’ve got to find a way to win. It doesn’t matter who’s on the other side. … But we can’t look too far ahead.